Extrusion Technology Book from C.H.I.P.S. The result of years of experience by experts in extrusion technology, Extruders in Food Applications brings together in-depth knowledge of extrusion cooking technology and practical experience in the application of this technology to the food processing industry. This concise new reference summarizes basic considerations for the application of extrusion technology to food industry processes and focuses on the various types of extruders available for a growing number of food applications. 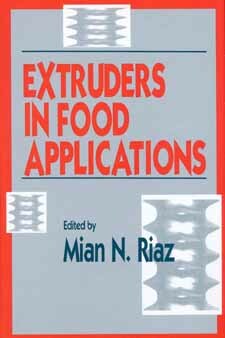 Chapters compare and describe the different types of extruders and their functions, including characteristics, advantages and disadvantages, and applications, providing a wealth of information about dry extruders, interrupted flight extruder-expanders, and single screw and twin screw extruders. The effects of preconditioning on the raw material and of extrusion on the nutrients of products are covered as well. This book is a valuable source for the technical and practical application of extrusion and will be useful for the selection of the proper equipment for this technology.